Easter has come and gone and after a wonderful celebration with family and friends, I am left storing my baby chicks and tucking away my Easter books until next year. But what about those stupid plastic eggs? As far as I know, you can't recycle them with your empty milk jugs and diaper boxes. They're so cheap that it seems like a pain to store them when I can just buy 50 more for two bucks next year. I always feel so guilty about things like that, though! 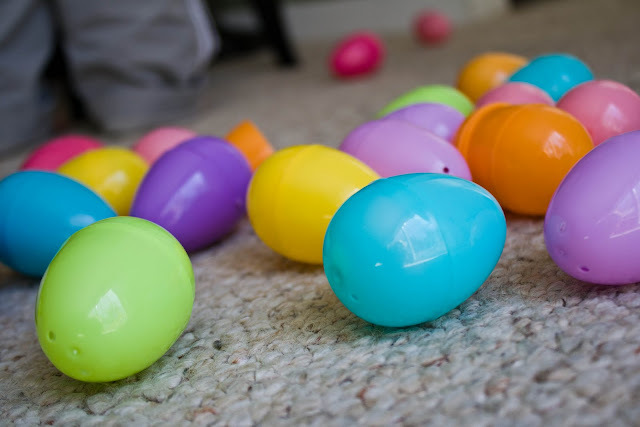 What's a mom to do when the party's over and there are a hundred egg halves kicking around underfoot, cluttering and cracking and irritating me to no end? 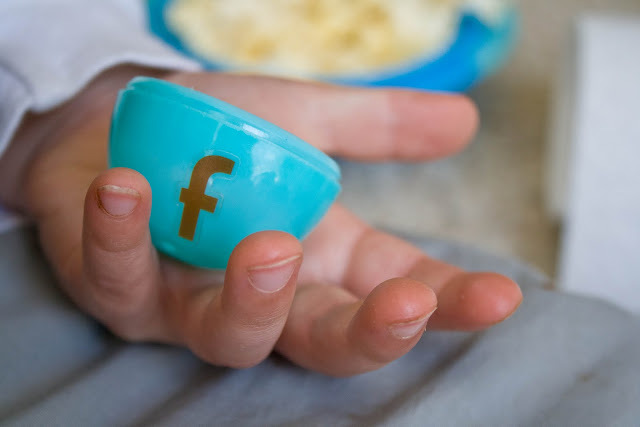 Well, you turn to one of my favorite blogs with the brightest ideas for all things parenting and fun. 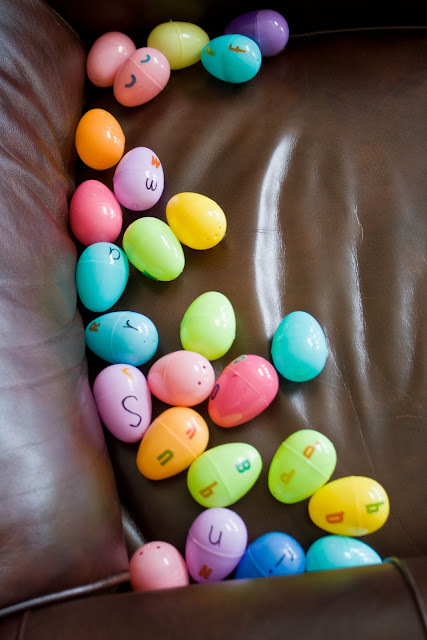 You may remember Modern Parents, Messy Kids﻿ from my Easter garland debacle, and the site is full of more beautiful and brilliant ideas like that. When I went MPMK on Monday, to my delight, I found yet another way to entertain and educate my kids, but this time, with an upcycling twist: 20 Activities for Plastic Easter Eggs! And considering the fact that I feel like I have three thousand eggs at my disposal, I bet I could get through all twenty, no problem. Well, here is my favorite idea which led to one wildly successful morning activity with Jax. 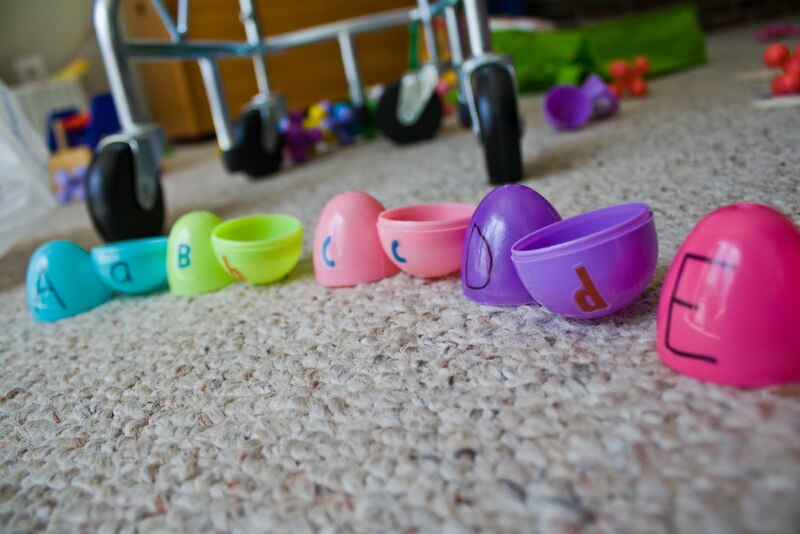 Upcycling (reusing my eggs for something even cooler) my plastic eggs into an alphabet game! If you know Jax, you know that this sounded like heaven to him. 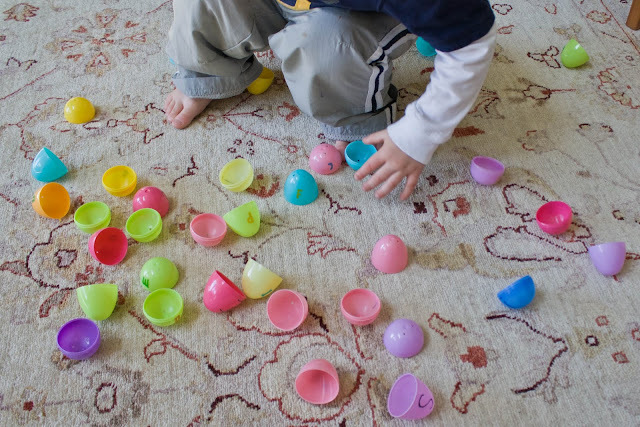 Take 26 plastic eggs and break them apart. Put an upper case letter on the top half, and its corresponding lower case letter on the bottom half. Break them up, scatter them on the ground, and have your preschooler match them up! 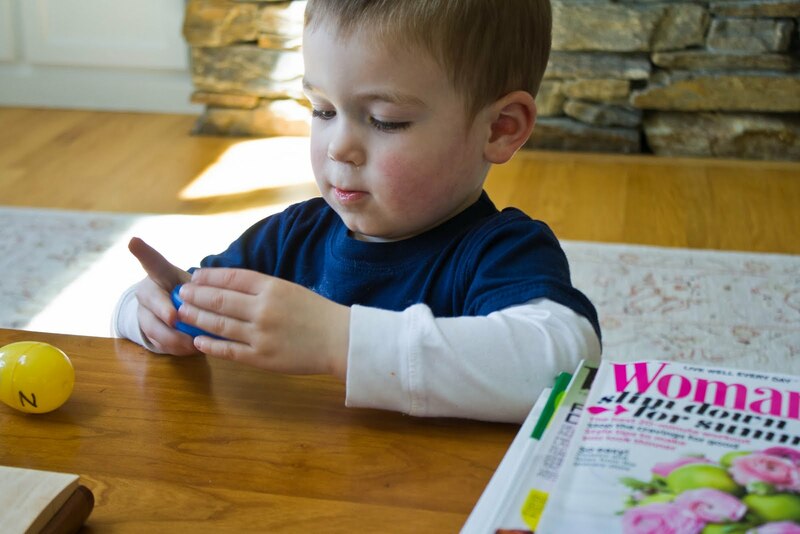 How old is your preschooler? How confident are they in matching games? How large is his or her attention span? 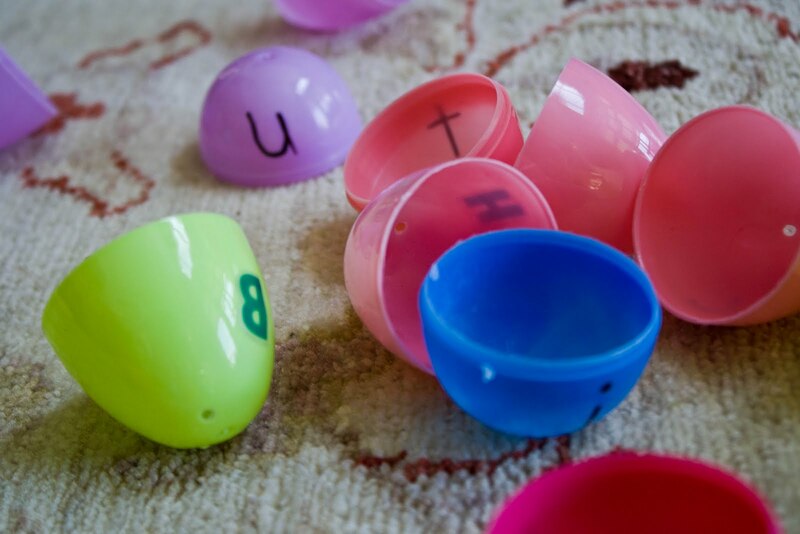 Jax loves letters, but doesn't necessarily have the patience to dig through 52 egg halves for the upper case L. I was glad I decided to keep my upper and lower case letters the same color, so that if he had a yellow "G," he could scan the other yellows for the lower case "g." If he had to look through all the colors every time, he would have gotten frustrated too quickly. Also, make sure your egg's lower case letter is facing up when the egg is connected. That way it's more clear to your kid that these two letters go together, big and small. As you can see, I didn't have all the letters of the alphabet (I bought a new package and they miraculously disappeared) so I used what I had and wrote the rest in with Sharpie. The Sharpie actually wiped off surprisingly easily, so be sure the ink is dry before you let your kids' grubby little hands get all over them. Jax erased both the "z" and the "D." He would hold the "z" in his hands and bring it close to his face and say, "Z, you're my favorite." He hasn't let the little "z" out of his sight since this morning. He even said it goodnight to it before nap. Here's to reusing something you would normally throw away in a new way! Even if you only use these once, it will be worth the ten minutes it took you to create this activity. I'm going to store them away and have them be a go-to game on a rainy or sick day, or when I'm just out of ideas. I do love having a little something colorful and cool in my back pocket! This craft was featured on BlogHer on the Green page! Exceptionally exciting! To see where the hops where this craft has been linked, check out my "Links & Things" tab above! That is a great idea. I am going to share that with my beastie. Love it. Not only is that a super idea (that I will probably use !) but you accompany the story with some great pictures! Thanks for your kind words about Modern Parents Messy Kids and for trying out the idea. I'm so glad Jax liked it and I agree with XLMIC - your pics are fantastic :). I am really glad that you linked up to Storytellers Blog Hop this weekend. I hope you found some good new reads and that ya'll had a great weekend! what a great idea, wish I would have thought about that when my kids were younger. oh my goodness!!!!! What a great idea!! My kids love playing with easter eggs. 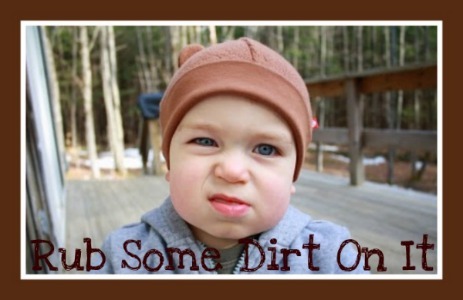 I found your blog through a blog hop and am now following you on GFC. 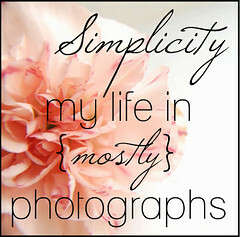 I'd love it if you could stop by http://moneysavvymichelle.com and follow me back. Thanks and have a great week! Great idea Becky! Leave it to a teacher to think this one up! What a clever way to recycle! If a couple of them get crushed between now and next Easter, so what: you can always get another cheap bag of them then! Great idea! Thanks for sharing! Stopping by and following from the Deals and Dishes Link Up Lounge. I've added your button to My Button Collection page. Btw, I have just awarded you The Versatile Blogger Award. Hope you can stop by and accept it. Very creative indeed. That could keep a little one busy for some time. I am following you via MMM blog hop. Please follow Mamaw's blog. Clever idea! 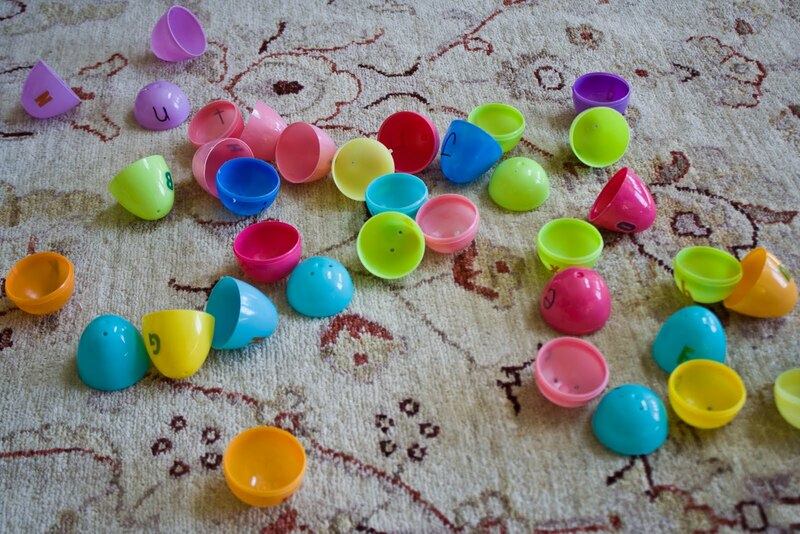 Great use of those plastic eggs, too! That is a really great idea!!! 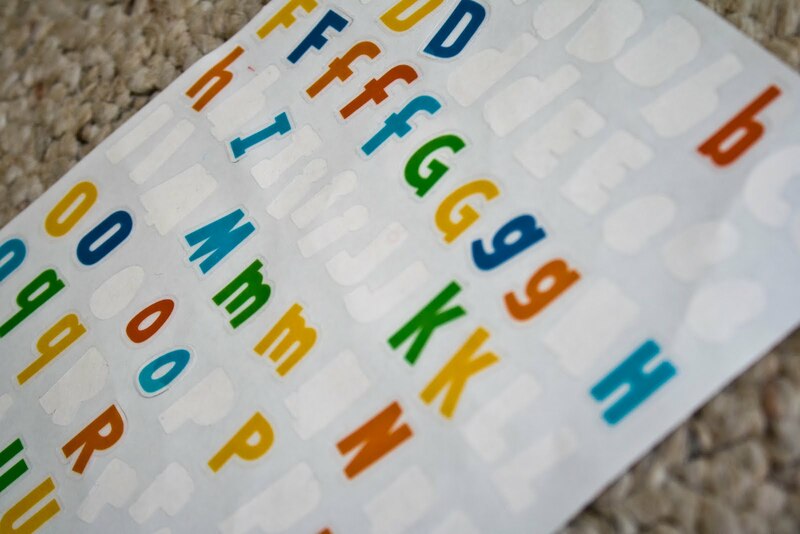 Perfect for my 2...he's learning numbers and letters. Great idea to use up those eggs! Just perfect for kids! Found you through LINK UP LOUNGE. Very cute idea. I am still looking at the bag o' eggs wondering what I am going to do with them. What a fantastic idea, love this! What a great idea! Wish I'd have thought of it a couple years ago! This is such a fun and creative teaching tool! Thanks so much for sharing this! Great idea, and I love "z, you're my favorite." WOW, this is a really great idea. My 4 y old boy will love it. thanks! Fantastic! Great idea...Thanks for linking up to Mad Skills Monday! TERRIFIC idea! 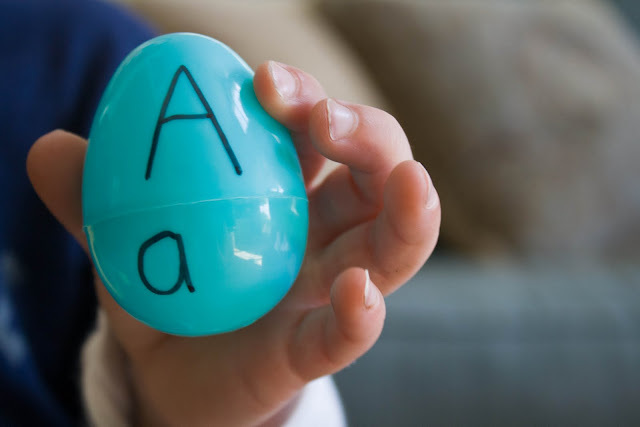 I'm a teacher and I've done a million academic things with plastic eggs but for some reason have never thought of this. My daughter is almost 7, so you've sparked an idea to use these for math facts in a similar way. Thanks! Fabulous idea! I'm totally using it! 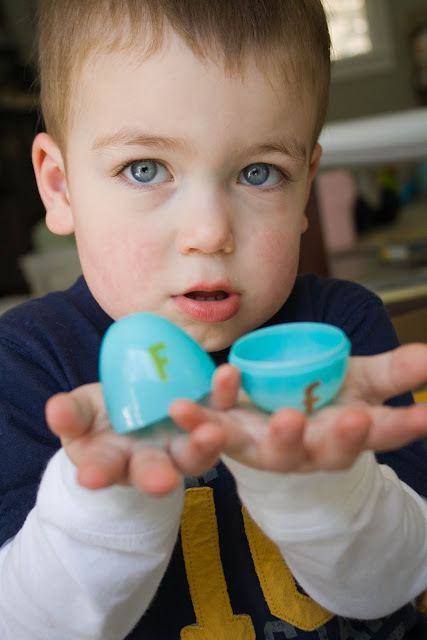 I love how cute he is with his little z egg too! Smarty Smarty! I love this idea!!! 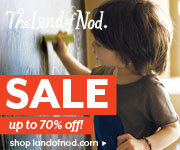 Feel free to snag the I Was Featured button for your blog and I hope you'll visit again soon! This is such a fab idea - I'm so pleased you shared it with us at the Play Academy. And I've been meaning to say, I love your blog hearder picture: so cute! You did good girl. I know this was just a no brainer on your part, but clearly many of us, are like DUHHHH, just brilliant idea, he he. I want to try this out with math, and maybe even picture puzzles. Thanks so much for inspiring me with this. Grand idea for lil ones, Becky!